Britain has dropped to 25th place on a list of the best places in the world to live - behind countries such as the Czech Republic, Lithuania and Uruguay. While France tops the poll for the fifth year running, the UK's climate, crime rate, cost of living, congested roads and overcrowded cities have pushed it even further down from last year's ranking at 20. The Quality of Life Index, published by International Living magazine for the 30th year, says the French live life to the full, while Britons are over-worked. In all, 194 countries are surveyed on nine criteria, including the cost of living, culture and leisure, environment, safety, culture and weather. Australia is placed second after France, followed by Switzerland, Germany and New Zealand. 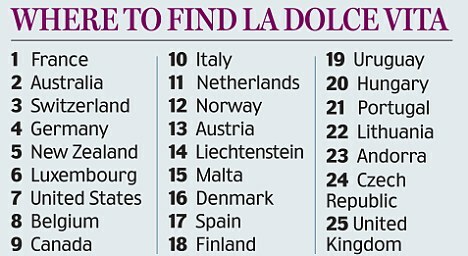 Even former communist countries where unemployment is still rife are considered better places to settle down in than Britain, with Lithuania and the Czech Republic coming in at 22nd and 24th place respectively. Britain does not top a single category in the survey, which is compiled using official government statistics, data from the World Health Organisation and the views of the magazine's editors around the globe. Germany is widely praised for its efficiency and leisure facilities, with the magazine noting that 'the Harz Mountains now has a specialist hiking trail for nudists. Germany is arguably the world's most naturist-friendly country'. oomaha28 wrote: 'Romantic Paris offers the best of everything, but services don't fall away in Alsace's wine villages, in wild and lovely Corsica, in lavender-scented Provence. Really interesting article, I enjoyed reading it. I note from the above that not only was the capital of France in the survey but also the outlying regions including small villages far from the capital. Do you know if the survey took in Wales and Scotland or was it based on an English lifestyle? I don't know how reliable or scientifically-based this survey is, but it would be interesting if a separate survey was done for the constituent countries within the UK. Some of us like it here Sweltered, and there is a huge difference between living in Florida (have lived there) and living in western New York, San Antonio, Denver, Minneapolis, etc. Bobbie En Tejas wrote: Some of us like it here Sweltered, and there is a huge difference between living in Florida (have lived there) and living in western New York, San Antonio, Denver, Minneapolis, etc. lol.. touche actually, i really disliked living in florida because I hated living in a tourist trap.. lived down near fort lauderdale. Easy..in one word..B E N E F I T S .
Exactly but my point is - surely that should be hugely taken into into account? Any one of us could need state help at some point and the fact that we could have that safety net is, to me, a defining feature of a good country in which to reside? It seems to me that the above list is for wealthy folks. Hi GG ! Thanks to Emdee..., I’ve just "stumbled" over this post ! Sorry ! Living in Belgium for over 30 years, I can confirm that all my best friends have moved to the South of France. (not the North) Done for the ambiance, cuisine, markets, weather, health, wine, olive oil, cheeses, French-bread and the Mediterranean flagrancies of pine, lavender and exquisite perfumes..., not to mention all the imported whiskeys, some of which are even unavailable in Scotland. Given the opportunity..., I’d do the same !